The list of officials also included former French Foreign Minister Bernard Kouchner and former US diplomat Peter Galbraith, according to a letter dated December 30 cited by Reuters and AFP. 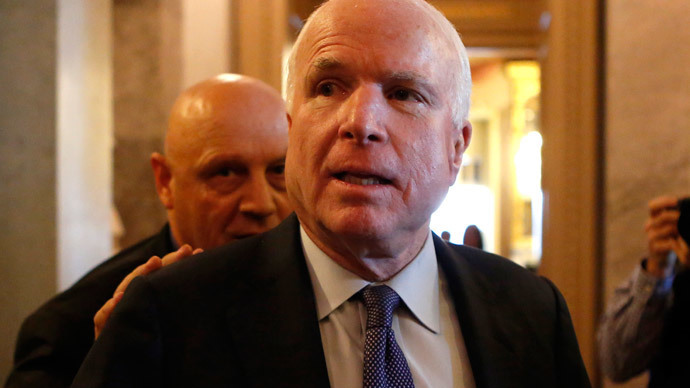 McCain responded to the complaint by downplaying the accusations, and in turn accusing Syrian President Bashar Assad of the “massacre” of his own people. According to earlier media reports, McCain crossed into Syria in May 2013 from Turkey with General Salem Idris, who was in charge of the Supreme Military Council of the Free Syrian Army, and stayed there for several hours before returning. During the visit, the senator met with leaders of Free Syrian Army units in Turkey and Syria. McCain’s visit created a media storm, especially after a picture surfaced of him posing with allegedly IslamicState-linked jihadists (formerly ISIS/ISIL). The original claim came from Kentucky Republican Senator Rand Paul, who accused McCain of unknowingly meeting with Islamic State fighters. Among the Senator’s other controversial visits was a trip to Ukraine in December 2013 amid mass anti-government protests. During the visit, McCain met with Ukrainian opposition leaders in the country’s capital of Kiev, voicing his support for the protests, adding that he saw Ukraine’s future with Europe. Also, back in 2011, McCain visited Benghazi to meet the Libyan rebels, calling them “my heroes.” McCain boldly stated that the fall of the ousted Libyan leader Muammar Gaddafi would inspire people all over world – including in Russia – which raised eyebrows globally. “We believe very strongly that the people of Libya today are inspiring the people in Tehran, in Damascus, and even in Beijing and Moscow," said McCain. McCain’s travel tendencies landed him on Russia’s black list in March, part of Russia’s retaliation against US-led sanctions. The list bans the Senator along with other individuals from traveling to Russia as well as freezes any of his assets there.